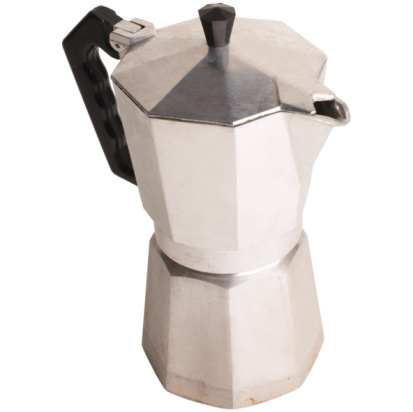 The Mukka Express from Bialetti is a coffee maker for use in the home to prepare cappucino or milky coffee. The traditional model is used on a heat source like a stove top, and the electric model plugs into a socket. The Mukka Express takes just four minutes to make two cups of cappuccino. The standard model has a distinctive speckled design which makes it easy to distinguish the Mukka Express from other coffee makers. Make a cappuccino in just four minutes with the Mukka Express. Unscrew the bottom half of the Mukka Express and fill the bottom half with water. Fill to indicator level 1 if using a gas heat source, and indicator level 2 if using an electric heat source. Insert the funnel filter and fill it with ground coffee. Do not press the coffee to compact it. Make sure no coffee is left on the edges; this would prevent the unit from closing properly. Add the top half of the unit and screw it shut. Open the lid and insert the pressure valve into the central column. Turn the valve from 0 to 1. The numbers are visible in the bottom of container. Fill the top half of the unit with milk up to the indicator level and close the lid. 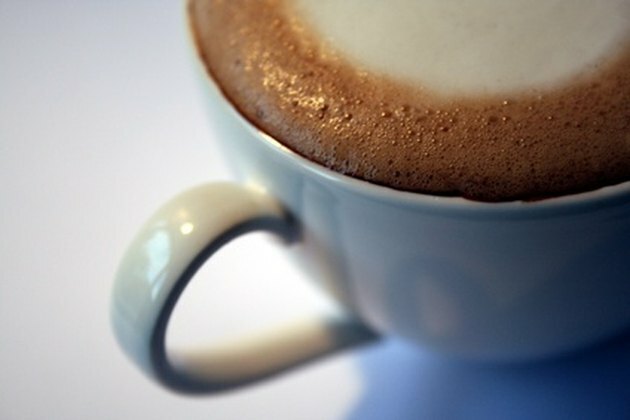 Press the button to make cappuccino coffee, or leave the button unpressed to make caffe latte. Transfer the Mukka Express to the stove. On a gas stove use a medium heat, ensuring the flame remains under the unit and does not reach the outer parts. Leave the unit on the heat source after the button rises and you hear the puffing sound made by the machine. The froth is created within 10-15 seconds. Remove the Mukka Express from the stove, carefully open the lid and pour the coffee into a cup, using a spoon to distribute the froth. Yolanda Solo has been writing since 2005. She has a varied background in investment banking, alternative medicine and real estate, with articles published online and in publications such as "BMI Baby Inflight Magazine." Solo is also the author of "Spain: The Expat Survival Guide." She has a Bachelor of Arts in Spanish and French from the University of North London, England.